I have heard, and made, a million jokes about them. I work at a circus theater, with and around many clowns. I wrote a book about a mime who can talk to ghosts. I have worked in comedic theater as both an actor and a playwright. But I have never seriously trained as a clown or put on a clowning performance. 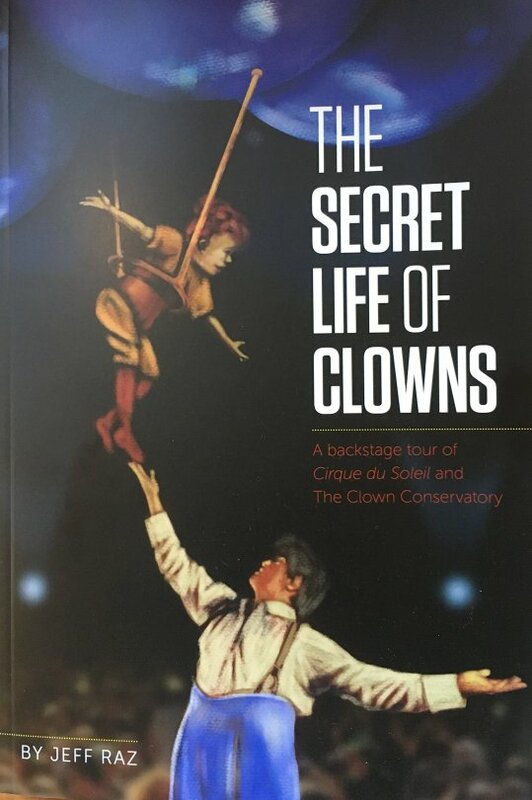 The Secret Life of Clowns, by professional clown Jeff Raz, offers a close and personal inside look to the art form and world of clowning. And when you pull back the veil from this much-mocked, oft-misunderstood performance style, you may be shocked to find…a bunch of theater kids. So you might not be that shocked. The Secret Life of Clowns is fiction-ish; it follows the parallel stories of fictional student Jake taking classes at the real Clown Conservatory school, and of the unnamed Director, balancing teaching and running the Clown Conservatory and touring as a performer with Cirque du Soleil’s show Corteo, which Raz did in 2007. The introduction justifies this structure of using a fictional student to be able to more clearly walk the reader through the lessons of the Clown Conservatory, but it feels a little suspect and self-congratulatory to have the student struggle but gradually realize the brilliance of Raz’s/The Director’s teachings and eventually get an amazing touring job right out of clown college. But that could also be some personal bias; Jake comes off as not just a bit of a prick, but a prick in the same way as a lot of entitled men I have met and worked with in the theater world. So points for realism, at least. I appreciated The Director’s storyline more, getting to see his challenges of working as a professional artist, trying to live up to the principles that he teaches, and trying to maintain some sort of good relationship with his wife and young sons back home. It captured a lot of the feeling of professional theater, or any professional artform: a lot of hard work, frustration, and slogging, with occasional moments of grace that remind you why you do it. Raz’s description of the “Helium” act in Corteo is lovely in the depiction of that grace. As are the complaints about crowded makeup tables and LA traffic, in their own way. The Secret Life of Clowns is not essential reading, but it did touch me at times as an artist. I don’t know if it would change any minds that don’t already have strong feelings about theater and circus, but it did hit me in the sappy artist feelings more than once, which makes it worthwhile in my book. Would I Recommend It: For the clowns and clown-appreciators, yes. Next Best of PlayGround 23! And the June Anne Baker Prize!